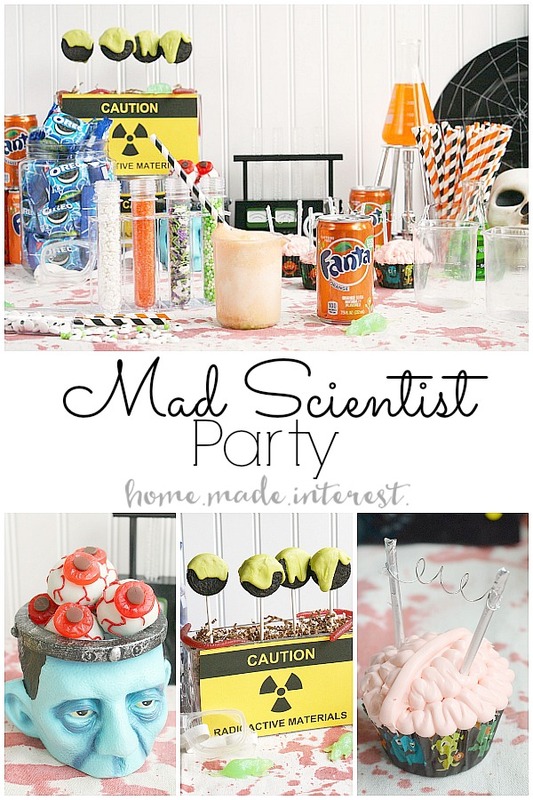 We’ve got some creepy ideas and recipe for a Mad Scientist Party this Halloween! It’s October which means Melinda and I have Halloween on the brain. This whole month is all about having fun decorating the house, cooking up new Halloween recipe ideas, Making cute Halloween crafts with the kids like this, and this, and shopping for that elusive “perfect” Halloween costume. Melinda just sent me a picture last night of her kids having fun trying on the costumes they picked out. Time to start practicing trick-or-treating! Halloween also means it is party time and I am so ready for this year’s Halloween party! 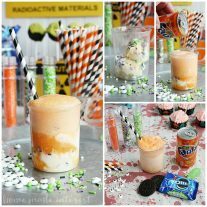 I’m recycling one of my favorite themes: Mad Scientist Laboratory and I’m upping the ante this year because we’re going radioactive! I was inspired by the new Glow-in-the-Dark OREO packaging for the 2-packs of OREO cookies (handing these out for Halloween too!). Note: This post contains affiliate links. This mean if you click on a product and make a purchase we may receive a small commission. Thank you! When I think of a Mad Scientist laboratory I think of test tubes, and bubbling beakers, weird electrical things buzzing and clicking, and of course creepy experiments. We’ll have a mix of young and old at the party so I like to keep the decorations and food just weird and gross enough I won’t lose my street cred without scaring off some of the younger guests. 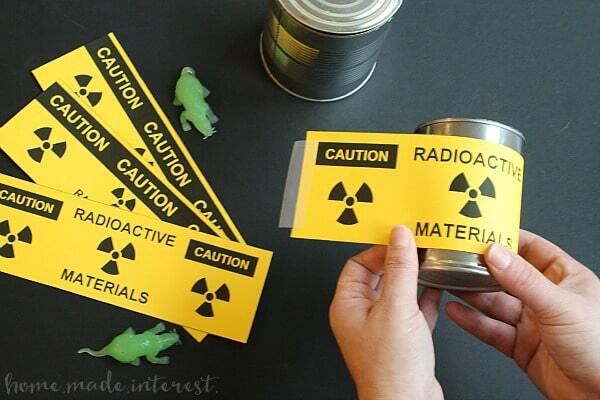 Since we’re going with a dangerous mad scientist laboratory theme I made several simple printables (DOWNLOAD HERE) for “Radioactive Materials”. I’ve printed them out on yellow card stock and wrapped them around empty tin cans as props for the table. I also made a few larger signs to hang on the wall. Mad scientists are a little gory, and not all that clean, so my tablecloth is a canvas drop cloth from a hardware store that I splattered with fake blood several years ago. It goes with just about every theme so it almost always makes an appearance at my Halloween parties. 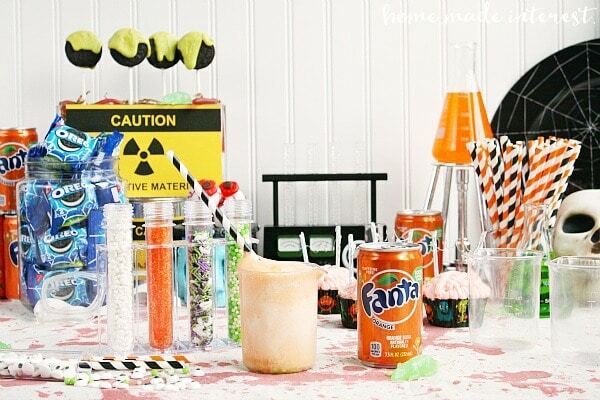 Then it is just a matter of adding test tubes, beakers, and other mad scientist equipment to the table. 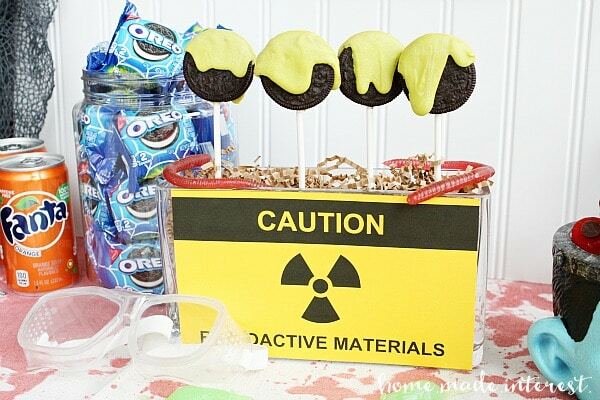 First up on the menu we have Radioactive OREO pops. I’ll have a specimen jar filled with Glow-in-the-Dark OREO 2-packs on the table. In the dim party light they will give off an eerie glow. Next to them I’ll have OREOs dipped in vibrant green candy melts to make them look like they have just come out of a vat of radioactive slime. Yum! 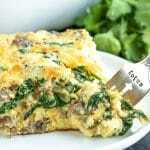 You can make these up to two weeks ahead of time and store them in an airtight container in your freezer. You know I love stuff you can do ahead of time. Place two scoops of ice cream in a cup. Add Crushed OREOS and Halloween candies/sprinkles. 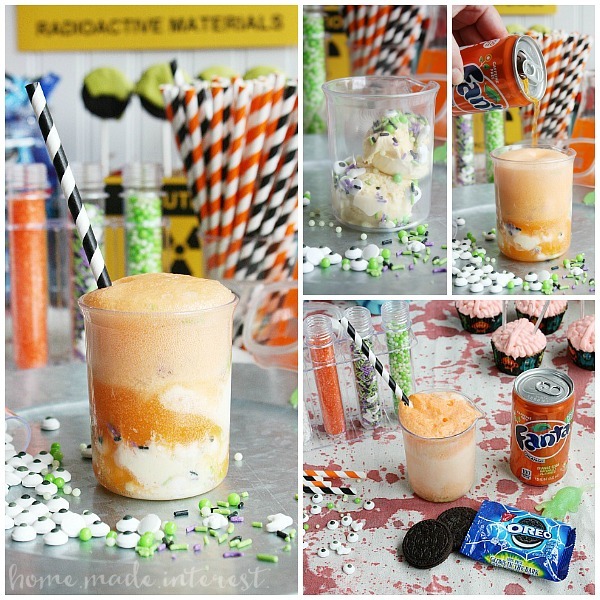 Pour mini can of Fanta over ice cream. We can’t forget the body parts, every good mad scientist has them laying around the lab. I’ve got OREO ball eyeballs on the menu, made using the OREO cookie ball recipe HERE, all you need to do is substitute white chocolate melts for the semi-sweet baking chocolate. 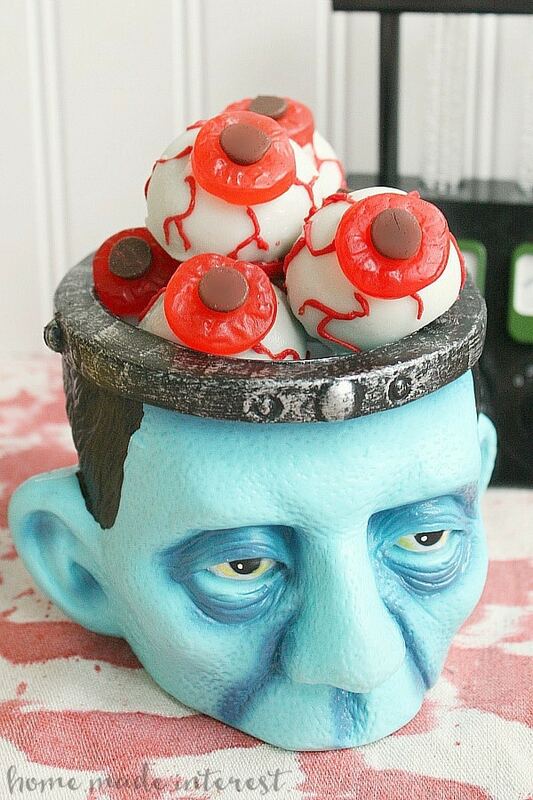 Then decorate the balls with round gummy candy, chocolate chips, and red chocolate for that extra creepy look. These take a little time to make but they are another party food you can make ahead of time. I have kept these in an airtight container in my freezer for up to a month! If you do freeze them I suggest taking them out of the freezer an hour or two before the party and spreading them out on a tray to let them come to room temperature. They will get a little condensation on them as they warm up and I like to be able to wipe that away before putting them in a bowl so they don’t get sticky. 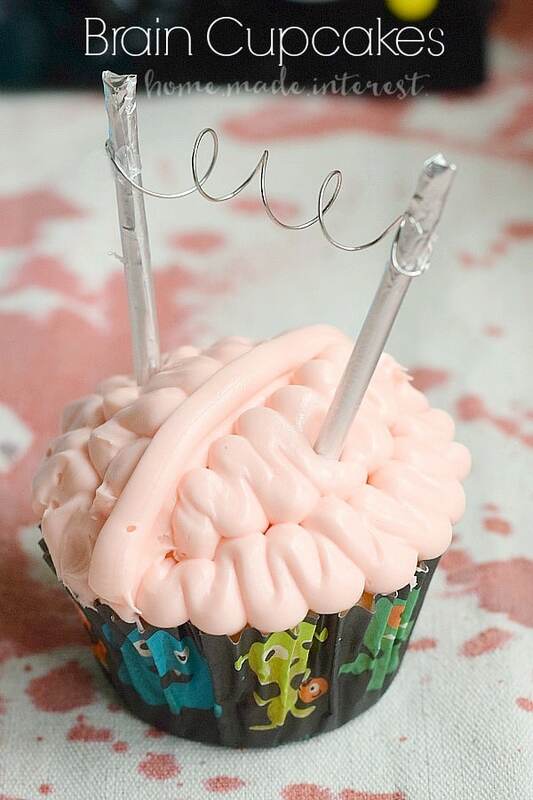 Last but not least, I’ll be making brain cupcakes. I know you’ve seen these before but I’ve made mine mad scientist level with DIY cupcake toppers that look like creepy electrodes. “It’s ALIVE! !” The cupcakes were extra easy to make because I used Fanta. 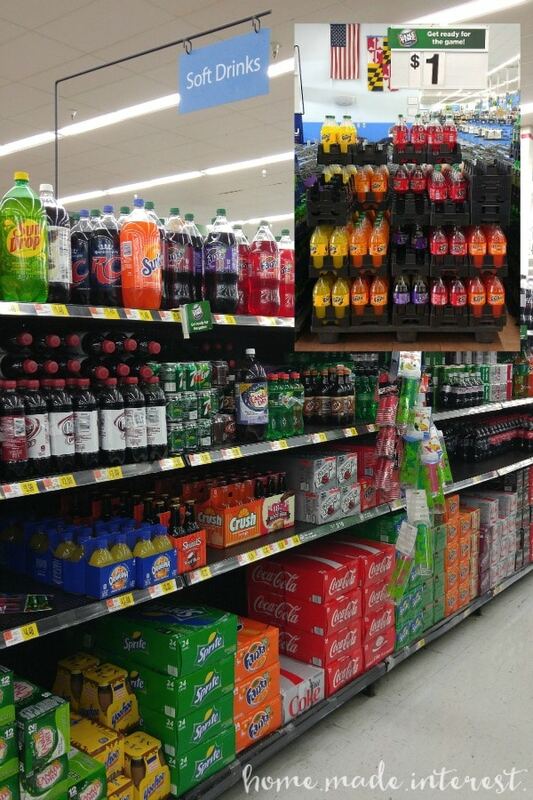 Have you ever made cake or cupcakes using soda? You just mix 12 oz. of Fanta with 1 box of cake mix and then bake them according to the cake mix instructions. So easy, so delicious! That’s it, just a few simple elements but it is going to be such a fun party. I already have my Mad Scientist Float all planned out, a layer of OREO, some edible eyes, and Fanta all the way to the top. Bring on Halloween! You can stock up on Fanta and OREOs at Walmart and, if you are looking for more Halloween recipes, make sure to check out their #SpookySnacks social hub. Evette Rios, host of the CBS show Recipe Rehab is creating a custom, Walmart-exclusive recipe that combines both Fanta and OREO products!